Is this a genital knowledge test? Skid marks on one’s thinking shorts is not a good sign. 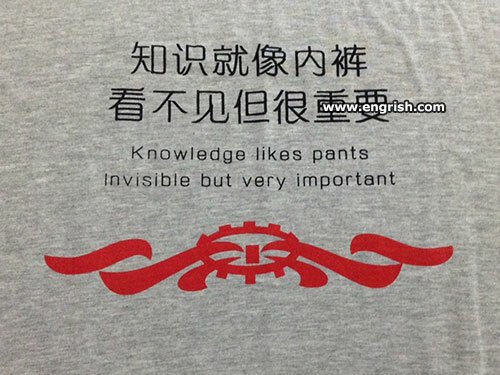 What it really says is: “knowledge is like underpants”. … hence this makes the second line a bit dubious because it implies Chinese underwear must be made from transparent plastic. Young kids get a lot of knowledge from why-fronts. So “Semper ubi sub ubi” is real! I heard: History is like your ar$e. You can never get round it far enough to get a good look at it. @BFC 0622. Or perhaps: Nunquam ubi sub ubi. Nicht wahr? Don’t get your knowledge from Fox news, unless you want to risk getting your brain a severe wedgie! @Ucity: Lisa Simpson’s catch phrase? This belongs in the “spurting section”. It’s all becoming clear to me…. If you get your “knowledge” from CNN, msnbc, or NBC, (etc) you waste a lot of time writing unfunny comments.